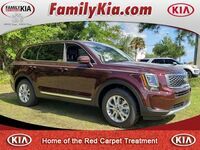 Family Kia of St. Augustine should be your first and last stop when you are searching for a pre-owned or new vehicle. We offer a large array of vehicles to meet all of your needs, as well as a very knowledgeable staff that is here to help you and answer any questions you may have, whether you are looking at buying or leasing your next vehicle. Come experience our Home of the Red Carpet Treatment. Buying a new or pre-owned vehicle can be a very big and sometimes stressful situation, at Family Kia, we try and remove any reservations you may have by giving you up front pricing and excellent customer service throughout the entire process. Reserve a 2019 Kia Sorento! Reserve a 2019 Kia Optima! Reserve a 2019 Kia Soul! Reserve a 2019 Kia Sportage! Family Kia is a locally-operated, family-owned dealership. We are not just a local business, we are a part of this community, which is why we believe in giving back to our community. We support local programs such as The Officer of the Month program with the St. Johns Sherriff's Office, the Flagler County Sheriff's Office Employee of the Month and sponsor several youth sports leagues in St. Johns County, Flagler and Volusia County. We are also proud to sponsor multiple sports and events at local high schools in St. Johns, Flagler and Volusia. Family Kia is proud sponsor of The Wounded Warrior Program. We go above and beyond when helping our customers, which is why we are a top ranked dealer in Customer Satisfaction as ranked by Kia Motors, guaranteeing that you will receive unrivaled customer service in both sales and service. Family Kia is a Kia Platinum Prestige Dealer, which is an award given to dealers by Kia Corporation for ranking in the top of all categories of business and customer satisfaction—only the top 3% of dealers in the world are awarded with this accolade. In fact, Family Kia is one of only 20 Kia dealers in the United States to win this award. Not to mention that Family Kia is the only local Kia dealer to win the Kia Dealer Excellence Program award for all 3 years it has been running. At Family Kia, when you purchase from us, you are joining a Family!